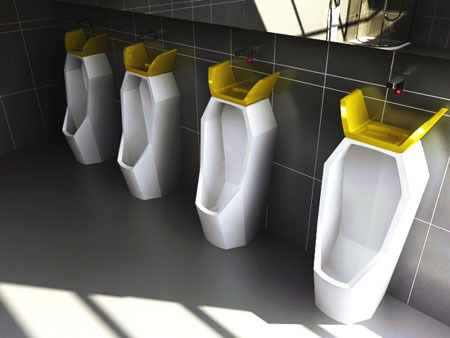 The King Of Urinal is a concept design for a urinal that helps to save on water consumption and promotes good hygiene. 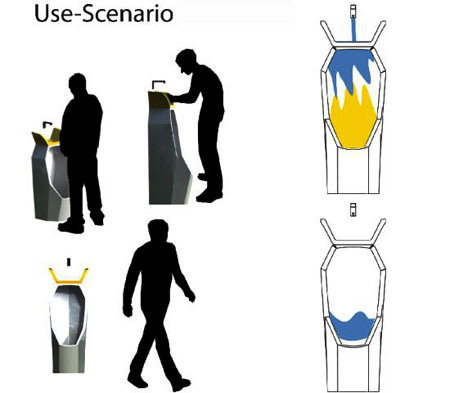 Each urinal features a sink built into the top of it which allows a user to clean their hands immediately after use and flushes the urine away without requiring any additional water. The King Of Urinal is a concept design by Jang Wooseok to help make urinals more sustainable in their water usage and to encourage users to wash their hand straight after use. The tap of the urinal appears to be triggered by a sensor, this coupled with the sinks location help to ensure that any germs from urinating are quickly washed away before having any chance to be transferred elsewhere. The water that is used to wash a users hands is then reused to flush the urinal. This reuse of the water helps to reduce the amount of water required to maintain a toilet facility. Usually fresh water is used to flush a urinal and any water used to wash hands simply becomes waste. By allowing the relatively clean hand washing water to be reused the system would quickly reduce the amount of water needed to ensure a clean and hygienic toilet area.